I'm on a continual quest to add more vegetables to our diet. I love veggies, but Jeremy's not as crazy about them. So, I like to experiment with new dishes that highlight veggies. The other night I was making a sauté of mushrooms, asparagus, onions, cherry tomatoes, and diced chicken sausage and wanted something to serve alongside. The head of cauliflower in the fridge became my ingredient inspiration and thus the mashed cauliflower recipe was found. I thought it was quite delicious; Jeremy liked the veggie sausage sauté over the cauliflower. 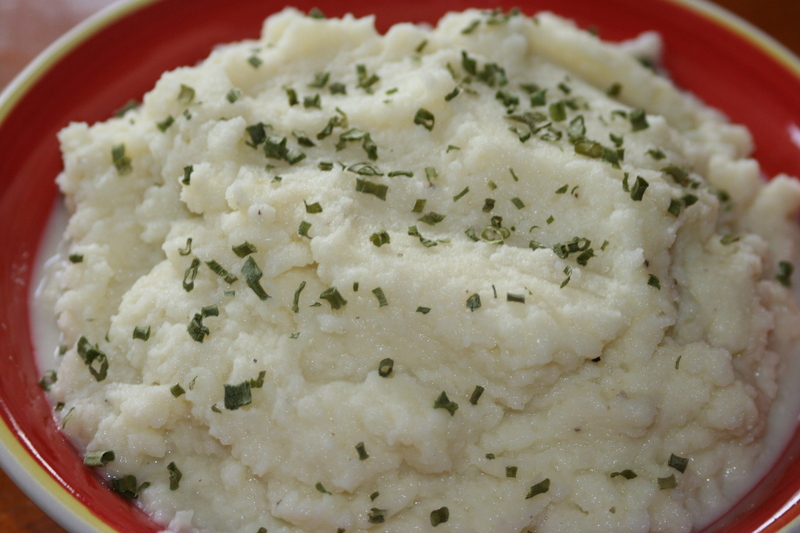 So, if you're looking for a new veggie dish to try, or a lower carb option to replace mashed potatoes, I suggest you give mashed cauliflower a try. I know I'll be making it again. Place cauliflower florets and garlic in a steamer basket over boiling water, cover and steam until very tender, 15-20 minutes. Place cooked cauliflower and garlic in a food processor. Add buttermilk, yogurt, olive oil, salt and pepper; pulse several times, then process until smooth and creamy. Add more buttermilk or yogurt until desired consistency. Garnish with chives and serve hot. Though we like cauliflower it always seem to get neglected in our house, this post made my five to try list for the week! I totally agree that cauliflower often gets neglected. So glad this recipe is one you look forward to trying!